The number of hate groups in the United States rose for a second year in a row in 2016 as the radical right was energized by the candidacy of Donald Trump, according to the Southern Poverty Law Center’s (SPLC) annual census of hate groups and other extremist organizations, released today. 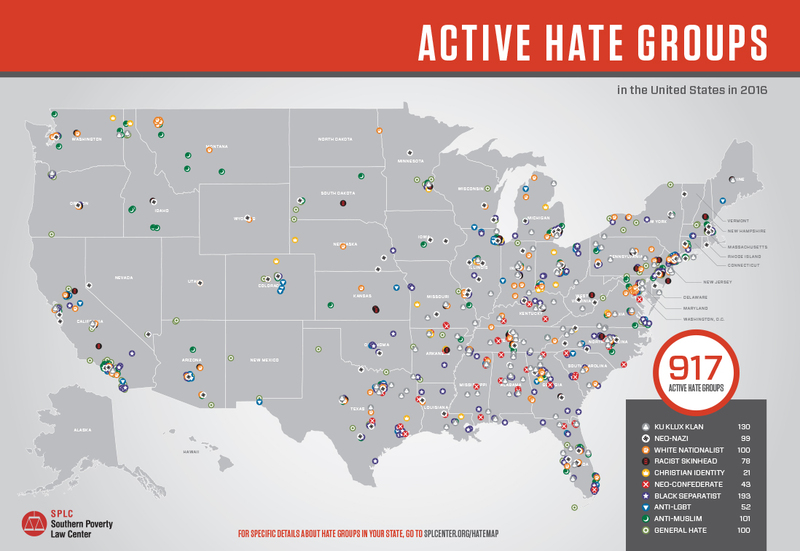 The report, contained in the Spring 2017 issue of the SPLC’s Intelligence Report, includes the Hate Map showing the names, types and locations of hate groups across the country. The SPLC found that the number of hate groups operating in 2016 rose to 917 – up from 892 in 2015. The number is 101 shy of the all-time record set in 2011, but high by historic standards. The increase in anti-Muslim hate was fueled by Trump’s incendiary rhetoric, including his campaign pledge to bar Muslims from entering the United States, as well as anger over terrorist attacks such as the June massacre of 49 people at a gay nightclub in Orlando. The overall number of hate groups likely understates the real level of organized hatred in America as a growing number of extremists operate mainly online and are not formally affiliated with hate groups. Aside from its annual census of extremist groups, the SPLC found that Trump’s rhetoric reverberated across the nation in other ways. In the first 10 days after his election, the SPLC documented 867 bias-related incidents, including more than 300 that targeted immigrants or Muslims. Also, in a post-election SPLC survey of 10,000 educators, 90 percent said the climate at their schools had been negatively affected by the campaign. Eighty percent described heightened anxiety and fear among students, particularly immigrants, Muslims and African Americans. Numerous teachers reported the use of slurs, derogatory language and extremist symbols in their classrooms. In contrast to the growth of hate groups, antigovernment “Patriot” groups saw a 38 percent decline – plummeting from 998 groups in 2015 to 623 last year. Composed of armed militiamen and others who see the federal government as their enemy, the “Patriot” movement over the past few decades has flourished under Democratic administrations but declined dramatically when President George W. Bush occupied the White House. The SPLC also released an in-depth profile of the Alliance Defending Freedom (ADF), an anti-LGBT hate group. Leaders of the legal advocacy organization and its affiliated lawyers have regularly demonized LGBT people, falsely linking them to pedophilia, calling them “evil” and a threat to children and society, and blaming them for the “persecution of devout Christians.” The group also has supported the criminalization of homosexuality in several countries. 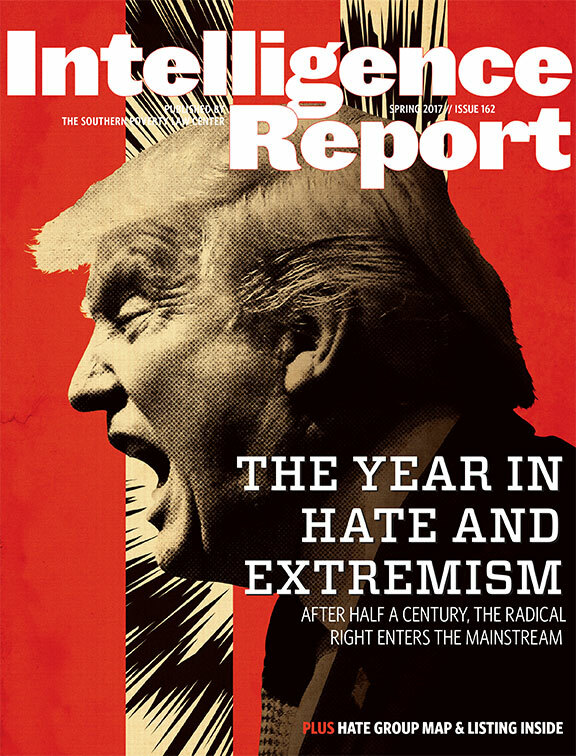 The Year in Hate & Extremism — by Mark Potok — The radical right was more successful in entering the political mainstream last year than in half a century. How did it happen? Eye of the Stormer — by Keegan Hankes — Propelled by the Trump campaign and a new focus on the 'alt-right,' the Daily Stormer is now the top hate site in America. One More Enemy — by Stephen Piggott — ‘Patriot’ groups have long seen the government as their primary enemy. But now, the movement is adopting Anti-Muslim hate. The Kidnapping of Isabella — by Ryan Lenz — In 2009, a former lesbian in a custody battle fled with her 7-year-old girl. The case still haunts the anti-LGBT movement today. Attorney for Aryans — by Ryan Lenz — Radical lawyer Kyle Bristow has started a new foundation that aims to become the legal arm of the racist radical right. The Trump Effect — by Mark Potok — The campaign language of the man who would become president sparks hate violence, bullying, before and after the election. Hate Map — An interactive display of all 917 active hate groups in 2016.